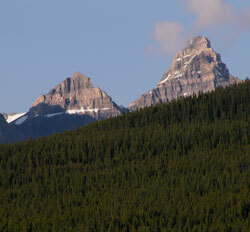 A distictive horizontal band of snow makes this one of the Ten Peaks easy to identify. Walter Perren came to Canada from Switzerland in 1950 and became a climbing guide for the Canadian Pacific Railway. In 1955 he joined the National Park Warden Service where he developed search and rescue methods and supervised training until his death in 1967. 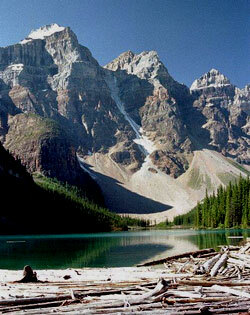 Peak #5 in the Valley of the Ten Peaks was renamed in his honour. There are two mountains referred to as Mount Perren. 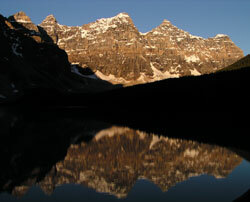 The officially named peak -enter Mount Perren (Ten Peaks), is in the Valley of the Ten Peaks. 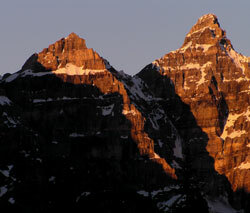 An unofficially named Mount Perren is near the Siffleur River.